Arithmetic studies patterns of numbers. Algebra studies patterns of variable numbers. Geometry studies patterns of shapes. Logic studies patterns of thought. Calculus studies patterns of motion, change, and space. Statistics studies patterns of data. Probability studies patterns of chance. Linguistics studies patterns of language. Topology studies patterns of position. 2. 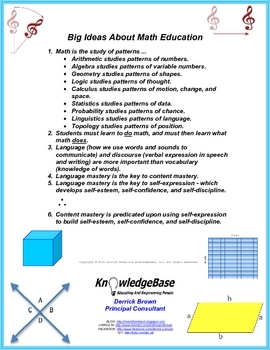 Students must learn to do math, and must then learn what math does. 3. Language (how we use words and sounds to communicate) and discourse (verbal expression in speech and writing) are more important than vocabulary (knowledge of words). 4. Language mastery is the key to content mastery. 5. Language mastery is the key to self-expression - which develops self-esteem, self-confidence, and self-discipline. 6. Content mastery is predicated upon using self-expression to build self-esteem, self-confidence, and self-discipline.